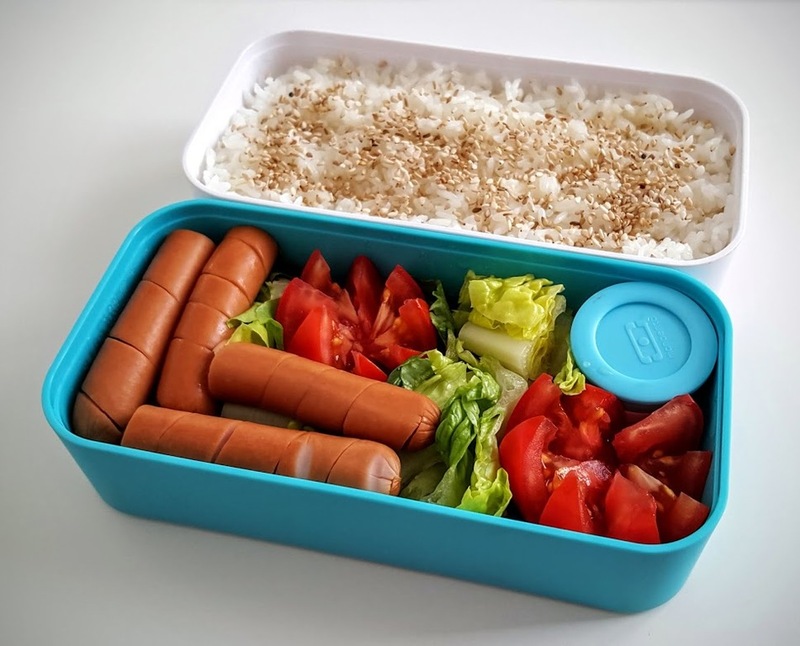 You will need a small pot for sausages and your bento box. Cooking rice in a rice cooker is strongly recommended, thanks to the press button and forget operation! Put your rice in a bowl or a pot and wash it with fresh water: pour water to about 3/4 of the container volume, then swirl the rice with your hand or a large balloon whisk to remove all the rice dust. Discard the dirty water and repeat this process from 3 to 5 times until the water is almost clear. Cook the rice following instructions of your rice cooker or packaging (when using the pot), while you prepare all the rest of your bento box. 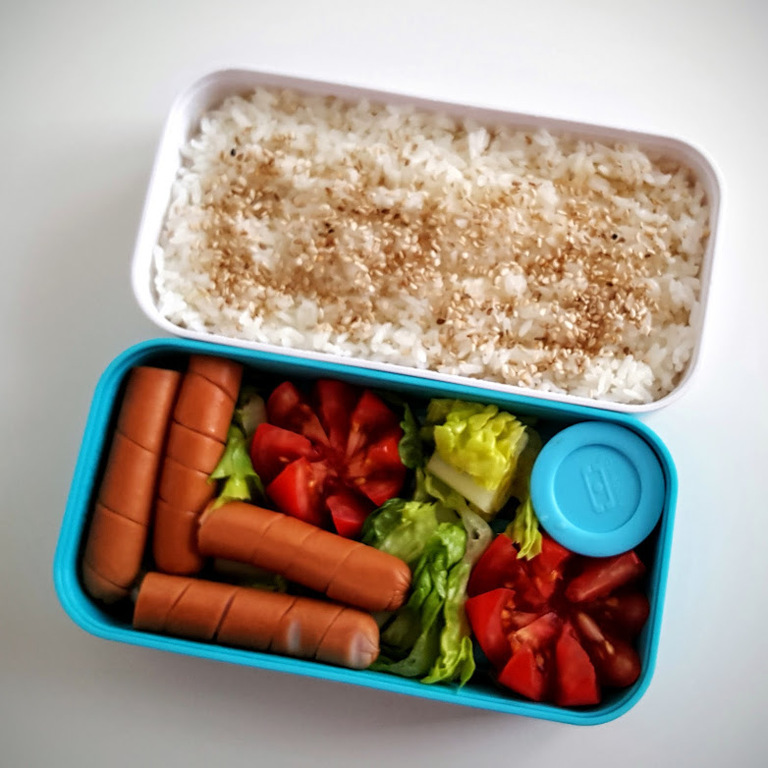 When done, fill your bottom bento box with the rice, sprinkle with sesame seeds and set aside covered with a clean cloth to let it cool down, while keeping the moisture in the rice. Slice each sausage in half, and then make a long, spiral incision along the edge — it will open while cooking, making a very interesting shape, and letting the spices infuse the meat inside! Set a small pot of water to high heat and when boiling, put your sausages in, add teriyaki sauce and turn off the heat. Let your sausages to get nice and warm in the hot water while you prepare the salad. After 3 minutes take them out and set aside in a sieve or on a plate to let out the extra moisture and heat. Clean your tomato and using a small, sharp knife make zig-zag incisions from outside to the center of your tomato. With some experience you can make wonderful decorative tomato halves. Cut off the bottom part of each half to make it fit your box (and that will also help it keep upward position!). Put your tomato halves in the box. Clean your lettuce and shred it into medium chunks (that you could easily grab with chopsticks or a fork). Lay the bottom of your top container with the lettuce to fill the remaining space around tomato halves. It will look fresh and tasty. Put your deliciously cooked sausages on top of your lettuce when they are cooled down. Remember to never close the bento box when ingredients are hot, because the water vapor that will condense all around the box can spoil your food! Close both of your boxes and you're done with the teriyaki sausage bento! Remember to put the barbecue sauce in the box for the sausages!